– 5 slices of bacon per basket (UK people – you really need streaky bacon for this). 1. 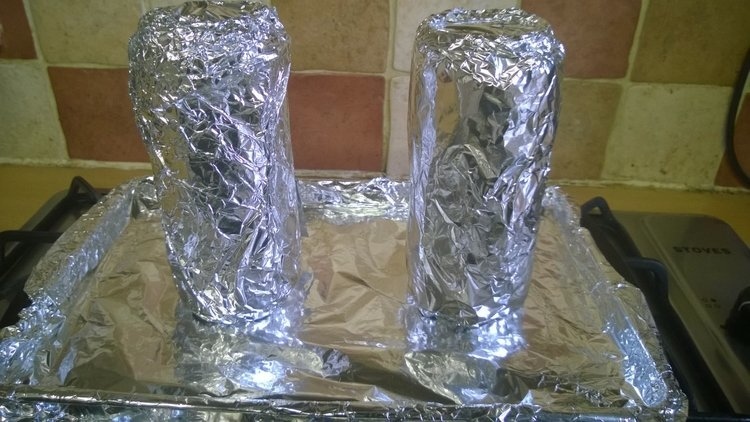 Cover the cans with foil. 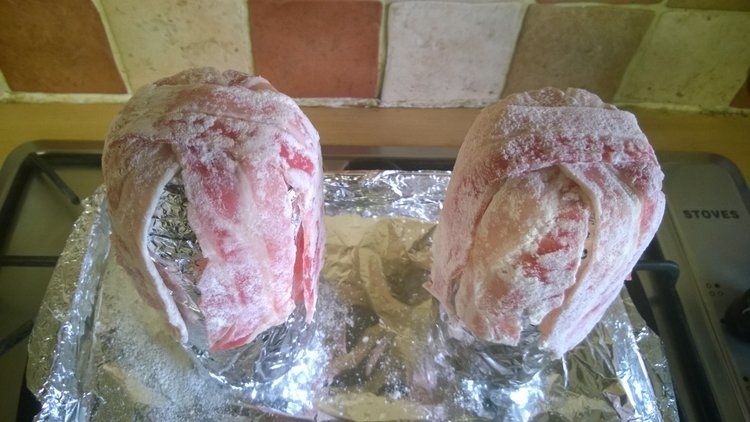 Place onto a tin, foil-lined if you want easy clean-up. 2. 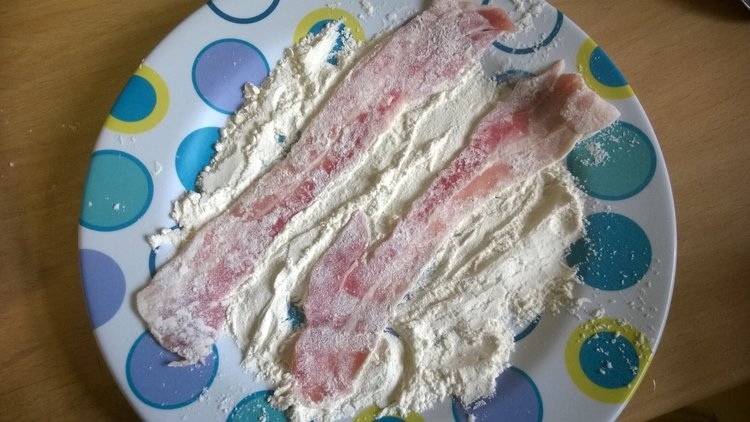 Lightly coat the bacon slices in flour. Most of the versions I found online didn’t involve any covering or tying, but they just came apart during the cooking for me. Maybe I’m just using the wrong type of bacon! 6. Place in the oven 160C/320F for about 30 mins until the exposed bacon on top is starting to get a good colour. 7. 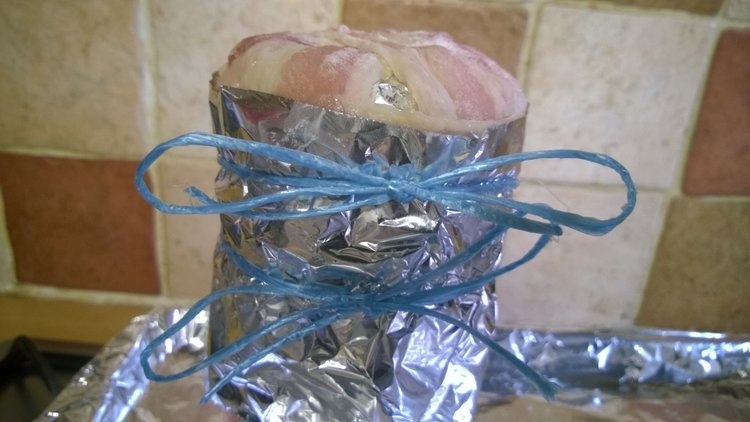 Remove the string and outer layer of foil. Do this carefully, even with the non-stick spray, it may have stuck a little. 8. 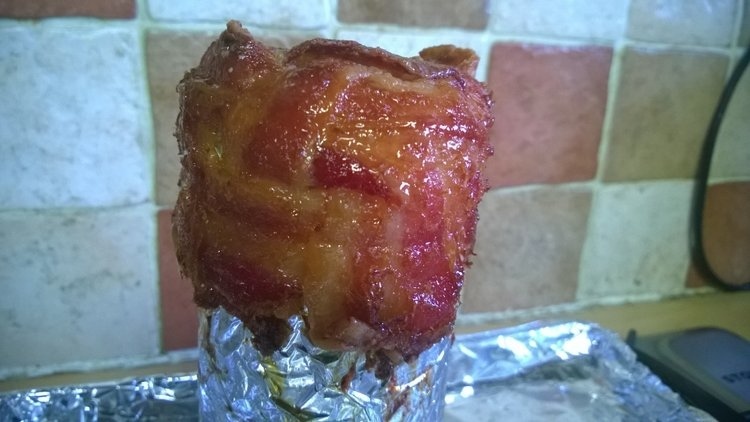 Brush the whole bacon basket liberally with maple syrup, then place back in the oven for about 10/15 minutes, checking regularly until desired colour and crispness is achieved. 9. Leave to slightly cool as is for a couple of minutes and then very carefully remove the basket from the can. This is a stage where I’ve had breakages. I suggest sliding a knife up and down around the inside edge to loosen it. If you didn’t use the non-stick spray then you really will be struggling here. 10. Allow to cool on a rack. These baskets make a nice way to serve a side salad or starter if you have guests for dinner, or instead of salad, use them for breakfast filled with scrambled eggs. I’m sure you can think of other things you could fill them with too – potato salad? Mini pancakes and more maple syrup? Maybe even a fruit salad? Any other ideas? Now, the first comment wasn’t there, I swear! I’ve had that happen before when I was commenting on someone’s blog! Just a delay in the system I guess. Well it was an epic journey of failures till I got here! These don’t quite fit with the healthy theme of your blog, well the salad’s ok, ha! 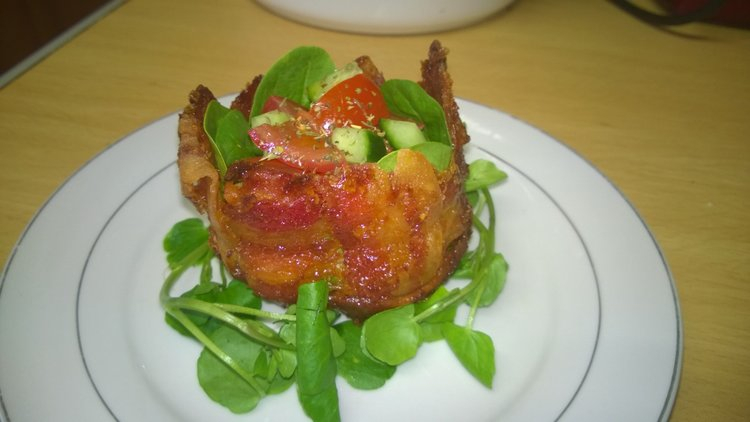 Yeah, no amount of salad can disguise the fact that there’s lots of unhealthy bacon there! It was very satisfying though when they finally worked after several times of them coming apart and breaking! I could do it just to challenge myself and invite guests when I knew I’d mastered the technique. I’d have to choose really YOUNG people who may not be bothered by all that…you know…makings of a heart attack. I want to blow their minds with my talents first. Ha ha. What an accomplishment! I think I’d like to try it for a fancy little brunch sometime. Thanks for going through all the trial and error for me! That’s ok! Although as I said, others seemed to have more success with simpler methods, so maybe it’s just me! 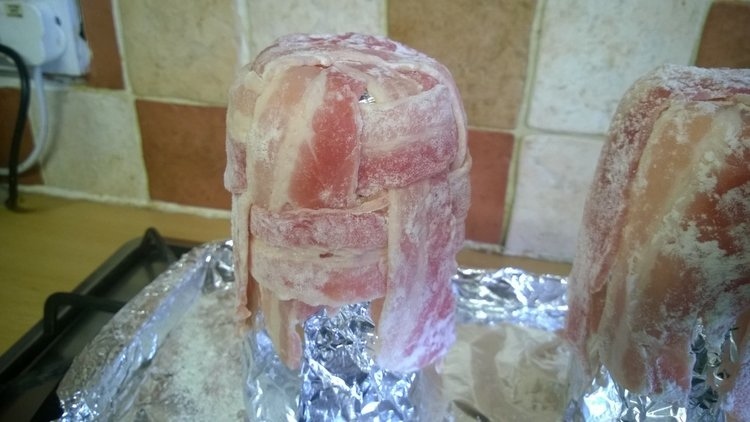 I’m thinking that it might be much easier with dry-cured bacon though because you get a lot less shrinkage with that. Pretty impressive!, … and pretty too!